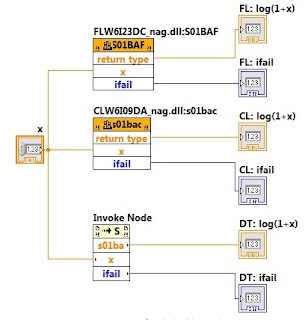 This is the latest in a series of blog posts about enhancing LabVIEW applications by using NAG methods and routines; previously, we've described in detail how to invoke methods from the NAG Library for .NET in LabVIEW, and how to call routines from the NAG Fortran and C libraries from within that programming environment. In addition, we supplemented those descriptions with an archive of examples which is available from the NAG LabVIEW page. The examples we looked at previously were all in the 32 bit environment, but some users have asked whether all this works in the 64 bit world, being keen to take advantage of the larger address space of that architecture. Indeed it does, as we shall show here.